To ask other readers questions about Out of the Dust, please sign up. Elena Griffiths It doesn't rhyme but it is read like a normal story but less word and more pages than necessary. Why do people think this book is so inappropriate? Karen Hesse's Out of the Dust (1998 Newberry Medal winner) is a poignant coming of age story chronicling a young woman's struggle with loss and hardship during Oklahoma's Dust Bowl. Written in blank verse, its rhythm somehow matches the spare landscape and emotional toil of the protagonist. It's an easy and quick read, but worthwhile. 3.5 stars rounded up. The other day, just out of the blue, I was hit with the thought, "Remember that book about the Dust Bowl you read for school ages ago, and hated with a fury? You should review it and avenge your past self for being subjugated to it." You know what's coming, folks. Time for another rant with Ryan. No character seemed to have any personality whatsoever. The writing style annoyed the living hell out of me. The story dragged on and on. And the only reason I didn't DNF this was because I needed to read it for a grade. - you are an only child and all of you, your father and mother, are all bone and skin because of poverty. At least the Joad family, in Steinbeck 1940 novel is an extended one and the men were able to work in the farm so they left Sallisaw for California. The Kelby family has no choice but to stay and wait for their death. The Joad family has 2-4 healthy men unlike here where there is only the father Bayard who works alone in the farm but unfortunately gets cancer in the middle of the story. At least, Rose of Sharon Joad Rivers of Grapes was healthy and her milk could feed the dying man. Here, the protagonist is a 14-y/o Bille Jo Kelby who’s still studying and only plays a piano to help the family and she has no milk yet. Okay this is a children’s book so let’s not go there. But seriously, the story is bleaker than Grapes and I am glad that I read this since the latter is one of my favorites. The Dust Bowl is the reverse of tsunami. During the dust bowl, it is hot, dry, and dust flies around like a black storm. In tsunami, it is water everywhere. Both of them are harrowing, shocking and can be unimaginably furious and can fatal to hundreds of people. This book is so depressing I wanted to shoot myself. When I look for books for my children, I quite frequently end up buying one book to explain and illustrate another. I had bought The Dust Bowl: An Illustrated History to give them (and myself, as I always end up reading their books as well) a new perspective on the Great Depression era, and this small children's novel in verse seemed to be a perfect complement to offer a more personal, direct approach to history through fiction. And what a book it is. Told in poems, through the lens of a young girl experiencing the dust storms in the Plains firsthand, it makes the dusty air and dried-up dreams tangible. This is a must read children's book for me. I loved it as a kid and I loved jumping back into it. If you haven't read it, I highly recommend. born at home, on the kitchen floor. I came too fast for the doctor, bawling as soon as Daddy wiped his hand around inside my mouth. I hollered myself red the day I was born. Red's the color I've stayed ever since. Daddy named me Billie Jo. That is how this book began, and what a powerful beginning it was. It surprised me when I learned the entire book would continue this way, written in blank verse. I had never read a novel with this format before, and after some initial resistance to it, I came to enjoy the way the words flowed on the page as Billie Jo, 14, voiced her thoughts about herself, her family, and her place in a world wracked with misery. Her search for ways to endure it, then combat it, was at the heart of this sad, but ultimately inspirational story. This book is a work of fiction, but the author based it on a conglomeration of stories from real life that she had taken from newspaper accounts of the Dust Bowl between the years 1920-1935. It was almost too much for me to read all those harrowing details of hardship compressed into one story of a young girl coming of age during that time. But same as with other historical fiction books, I finished it and stood as a witness in honor of those who had suffered, and felt gratitude at never having gone through what those people did during that time. lightning danced down on its spindly legs. I sensed it before I knew it was coming. I never enjoyed my history subject when I was young, I always have the worst teacher and the worst field trips in my entire life. Contradict to that, I enjoyed reading historical fiction and children's books. Although I don't have any idea about dust bowl or the great depression or whatever happened that time. I told you, I never learned something from my world history teacher. But after reading this book last year, I was amazed that Karen Hesse wrote something emotional for children to love and I never enjoyed my history subject when I was young, I always have the worst teacher and the worst field trips in my entire life. Contradict to that, I enjoyed reading historical fiction and children's books. Although I don't have any idea about dust bowl or the great depression or whatever happened that time. I told you, I never learned something from my world history teacher. But after reading this book last year, I was amazed that Karen Hesse wrote something emotional for children to love and to learn by reading, not in prose but in verses. Imagine a depressing book for children! I like this kind of books, not because it was so emotional or too gore because I can feel emotions of the characters and the events that happened on the book. Maybe the verses really put something special and added more spices for the book to be like and won the Newberry Medal. The book was also called as verse novel, a type of narrative poetry in which a novel-length narrative is told through the medium of poetry rather than prose. Either simple or complex stanzaic verse-forms may be used, but there will usually be a large cast, multiple voices, dialogue, narration, description, and action in a novelistic manner. This type of writing is also used in some of the famous novels like Iliad. Maybe some find it annoying or find it too elegant, it depends on the reader itself. The novel happened in 1934 to 1935 where Oklahoma is in a state of depression because of the great drought and dust storm happened. Hesse said, that in the late 90s issues like this was not entirely been covered by the media and only limited resources were shared via newspapers and journals. It must be depressing in their own time and place with limited food and water, destroyed shelter, dieing relatives and dust pneumonia. As a kidg, how can you help yourself and your family to survive in the dust? Billy Jo, started writing in the year 1934 describing her physical characteristic and her love to music. She wanted green fields and flowers that blooms and smelled like the morning but a very tragic happened, a great drought soon came and started a dust storm that killed the plants, the animals, her friends, family and even her dreams. She was a simple kid with a big dream, wanted to play piano vigorously, non-stop and had a crush like normal kids. Those dreams dry up when her dad accidentally stored a bucket of kerosene and her mother boiled and splashed with the kerosene that burned her mother, her fetus brother and her delicate hands. Losing not only her dream of having a happy family but also her mother's dream for her to go outside Oklahoma to study and play piano. She managed to move on and try to be like any other girls. Can she survive from the loneliness and depression that manifested all the people that time or she will be another corpse for people to mourn with? But that time not all people mourn for their safety, but they also enjoyed what little they have from the food they shared to the people who sheltered them. Playing pianos and small dance gathering were the only happiness they have. While reading the book I was like reading in proses, Hesse didn't used rhyming words and the book is specially crafted for children. and what happens when dreams dry up." Because of major agricultural farming, soil were becoming unfertile and people were not prepared to face the long drought causing dust storm. I read this book (historical fiction told in prose poetry) yesterday. Then, this morning, I saw in the newspaper that the Oklahoma Panhandle (where the book is set) is experiencing a drought worse than during the Dust Bowl, the time period of this novel. I think if I had been able to read this as a child, it would've made an even bigger impression on me. It would've stayed in my memory and I probably would've gone on to read Steinbeck's The Grapes of Wrath when I got older. (I still need to do th I read this book (historical fiction told in prose poetry) yesterday. Then, this morning, I saw in the newspaper that the Oklahoma Panhandle (where the book is set) is experiencing a drought worse than during the Dust Bowl, the time period of this novel. Since reading John Steinbeck’s Grapes of Wrath, I’ve often wondered how life could’ve been to the Oklahoman farmers and families who opted not to leave their land. 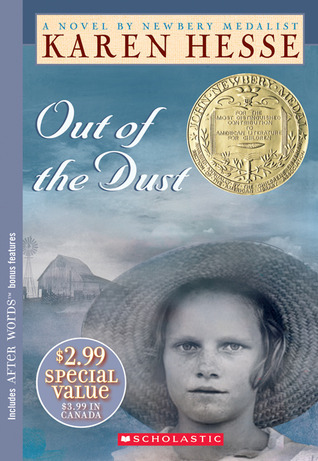 Karen Hesse, in her 1998 Newbery Medal book Out of the Dust, gives us a glimpse of the rigors of farm life in the Depression-era, Dust Bowl Oklahoma through the eyes of Billie Jo as her father scrapes a meager living out of the parched, drought-stricken fields while she grieves the accident that kills her mother, maims her own hands and left alone deals with her own pain amidst the constant gust of dust storms that razes everything on its path, even the feeble resolve of the Panhandle farmers. As Billie Joe sees her life slowly crumble before her eyes, blown away like dust in the wind, a grim determination sets in and wills her to endure. I believe what sets Out of Dust apart from other children’s book is it doesn’t sugarcoat life, specially to the children which is the book’s target audience, in that Hesse never tell anything less than the truth — a fact immediately palpable once you get to know Billie Jo and her struggles; a fact undoubtedly felt by anyone who’ve come face to face with tragedy and loss; a fact that lingers as you shed a tear or two as she survives and rise to the challenge and arrive at an empowering resolution; a fact shared by all those who read the book calling it nothing short of “depressing,” haunting,” “harrowing,” “an unforgettable read” and whatnot. What’s really unusual with this book is it is written in free-verse form, the very first I had ever encountered in a children’s book, wherein each episodic poem is like a diary entry that can be read individually but in its whole presents a bigger picture with an accurate sense of time and place, capturing in minute detail the range of emotions the protagonist feels. But what I think is the real genius behind this style is it is almost a subtle understatement to the spare and bare-boned life that Billie Jo and his father lead. Indeed, poetry is the best form to tell Billie Jo’s story conveying by an economy of words and sparse structure a heart that wastes not a single beat yet pulsates with animation, lips that wastes not a single word yet enough to take our breath away. Working with a variety of themes, what lies at the core of Out of Dust is its lesson about roots and forgiveness. Roots, with its strong emphasis on the strong bonds that unite family members together as seen through the relationship of Billie Jo and her father Bayard who, coming to terms with the death of her pregnant mother, his wife, must redefine the way they see and treat each other; roots, seen through the steadfast belief of the farmers to the land that they tilled for all of their lives that somehow, someday rains will once again pour and bless them with bounty that was once theirs for the taking. Ultimately, it’s the lesson about forgiveness that has the lasting impact to me. Billie Jo is an inspiring character though living in the 1930s Depression era speaks the universal truth that in order to find the courage to move on forward in life, one must not only forgive others for the pain and suffering others have brought, but in the end one should forgive one’s self and in that light realize that yes, we can still weep in sorrow but must not shut ourselves to the joy and the remarkable things life offers by accepting it with hear-felt gratitude. Through her, I wish readers will learn to appreciate more what they already have in this present day, wherever you are, living or not in harsh conditions in this simple tale of a simple girl and the simple things in life she learned because of dust. Book number 4, I mean 6, on my Young Adult whirlwind reading binge. I think these books are making my head go softer than it already was. This is an ambivalent three stars. This book didn't do much for me. I like that the reviews that I glanced at for this book all called this really depressing. Maybe I don't like it, but I find it kind of amusing. I didn't find it all that depressing, the most depressing thing in the book I think was lifted from Woody Guthries life, opps. I don't really know ab Book number 4, I mean 6, on my Young Adult whirlwind reading binge. I think these books are making my head go softer than it already was. But there was nothing about the book that angered or annoyed me, it just didn't do much for me. I remember loving this book! I first this in maybe high school? I read it again last year. Out of The Dust is such a profound impactful read. I didn't appreciate all of its nuances until I read it as an adult. So tragic. So beautiful written in a unique style. Perhaps Out Of The Dust should be required college reading. Karen Hesse' s words stay with you long after the reading is done. FABULOUS. Plus the saddest book I have ever, ever read. Glad I finally checked it off of my Newbery list! This review has been hidden because it contains spoilers. To view it, click here. Very interesting story set in mid-1930s Oklahoma during the times of the “Dust Bowl,” a continuous series of dust storms that rolled across the prairies, leaving ruined crops, ruined people, and ruined families in their wake. The book is written as a sequential series of free-verse poetry, individual poems with individual titles that describe the days of 16-year-old Billie Jo, who loves school and playing the piano. And then, even worse than the dust, Billie Jo’s mother, heavily pregnant, suffer Very interesting story set in mid-1930s Oklahoma during the times of the “Dust Bowl,” a continuous series of dust storms that rolled across the prairies, leaving ruined crops, ruined people, and ruined families in their wake. The book is written as a sequential series of free-verse poetry, individual poems with individual titles that describe the days of 16-year-old Billie Jo, who loves school and playing the piano. And then, even worse than the dust, Billie Jo’s mother, heavily pregnant, suffers a horrendous accident. Ma made a rope of fire. throwing it out the door. I didn’t know Ma was coming back. was a column of fire. I pushed her to the ground. beating out the flames with my hands. what skin she has left. She smells like scorched meat. it looks nothing like my ma. It doesn’t even have a face. so I couldn’t hear her. Hesse does a magnificent job of describing the relentless nature of the dust storms, one after another, pierced between by tiny hopes for rain, and the utter helplessness of those who depended on the land to earn their living. I had no idea that the wind-blown dust could accumulate in “drifts,” even throughout the house. mountains of dust pushing over barns. Billie Jo and her father are left to manage as best they can amongst the grief and the dust, the heartache, the guilt, and the desperation that permeate their lives, and we learn how they eventually reach a place of forgiveness. A heartbreakingly beautiful story. Out of the Dust is my kind of book. It is an incredibly emotional story told through poetry. The book is slow paced because of the poetic convention but this allows your feelings to develop and grow as you sympathize for the main character Billie Jo and her family. Even though Out of the Dust is set less than a century ago it feels like a very different world. The Depression was tough for a lot of people but the Dust Bowl was truly horrific. Often times when people think about such major tragedi Out of the Dust is my kind of book. It is an incredibly emotional story told through poetry. The book is slow paced because of the poetic convention but this allows your feelings to develop and grow as you sympathize for the main character Billie Jo and her family. Even though Out of the Dust is set less than a century ago it feels like a very different world. The Depression was tough for a lot of people but the Dust Bowl was truly horrific. Often times when people think about such major tragedies in history they forget about individual people and their own stories. Or when authors write historical fiction they let the conflict set a backdrop and barely go into it focussing on the characters and their lives. Out of the Dust balances the two really nicely. Billie Jo is a young girl and might not understand a lot of what is going on around her, but it is not difficult to understand what things really mean when you have the right background. Even without the background it is not difficult to imagine the significance of what happens. In the fifth grade this book was pivotal to my understanding of the Depression and the Dust bowl. Told through the eyes of a young girl Billie Jo was easy to identify with even if her struggles were not. The way the free verse poetry lends itself to the reader makes the troubles and the emotions of Billie Jo very plain spoken. Her words really hit home creating vivid images of thin sheets of dust covering food, thicker layers of dust caving in houses, the layers of dust hanging in the air making it necessary to wear bedsheets over open wounds. It's gruesome and terrifying to think about. 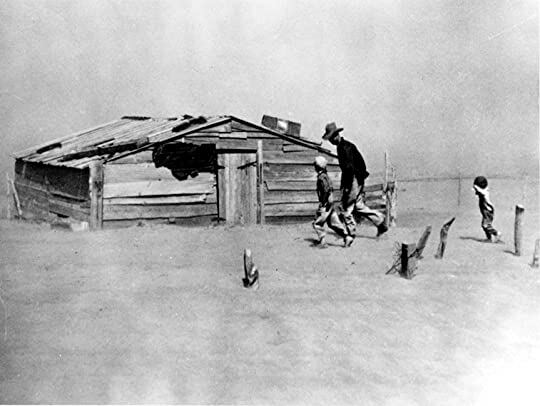 Even though the Dust Bowl was a natural disaster it was still caused by poor Agricultural techniques as described by Billie Jo when she mentioned her father taking out a loan for more wheat (a government New Deal incentive) which was squandered away just as fast as he could drink the money away. The book is laced with a lot of emotional baggage dealing with poverty, alcoholism, guilt and shame, despair, and perseverance. They were dealt with delicately and the poems were empowering. The book flowed nicely and poems echoed one another hauntingly reminiscing the time before the trouble and looking for a hope. This book is set in the Oklahoma panhandle during the 1930's. Preteen Bille Jo and her family struggle to cope with the loss of their farm, scarcity of food, and the endless swirling dust storms that dominate life in this setting. Then tragedy strikes; Billie Jo's mother and baby brother are killed in a sudden accident and Billie Jo's hands are seriously burned. Billie Jo's father withdraws into grief and depression while Billie Jo wrestles with her own guilt and physical disability. Ultimately, This book is set in the Oklahoma panhandle during the 1930's. Preteen Bille Jo and her family struggle to cope with the loss of their farm, scarcity of food, and the endless swirling dust storms that dominate life in this setting. Then tragedy strikes; Billie Jo's mother and baby brother are killed in a sudden accident and Billie Jo's hands are seriously burned. Billie Jo's father withdraws into grief and depression while Billie Jo wrestles with her own guilt and physical disability. Ultimately, Billie Jo discovers her deep love for her father and recognizes that she has the strength of character she needs to cope with all of life's difficulies. Tough read. But then the Dust Bowl was a tough time to live through. Moments in this story are very dark and depressing. But then the Dust Bowl was a dark depressing time. Through most of it I felt like I was eating dust. But then people who lived through the Dust Bowl really did eat dust. At least I only had to eat it while I read the story. Those who lived through it couldn't get away from it. Dust was their constant unconquerable bane and companion. What I think this story is really about is t Tough read. But then the Dust Bowl was a tough time to live through. Moments in this story are very dark and depressing. But then the Dust Bowl was a dark depressing time. Through most of it I felt like I was eating dust. But then people who lived through the Dust Bowl really did eat dust. At least I only had to eat it while I read the story. Those who lived through it couldn't get away from it. Dust was their constant unconquerable bane and companion. What I think this story is really about is the tenacity of the human spirit to survive. No matter what nature or life throws at us, some of us will continue to live. And out of that survival, out of the dust, those of us who remain will grow and flourish and plant anew. Fourteen year old Billie Jo from Out of the Dust is a memorable and unforgettable character. A 1998 Newbery Award winner, this story of dust, poverty, tragedy, and despair is one of the saddest I’ve ever read. I think its free verse format brings some beauty to the story. Set in Oklahoma during the Great Depression and Dust Bowl years, Billie Jo endures significant tragedy, loss, and despair. In the end, her fighting spirit, her hope in the future, and her ability to forgive are truly memorable. Fourteen year old Billie Jo from Out of the Dust is a memorable and unforgettable character. A 1998 Newbery Award winner, this story of dust, poverty, tragedy, and despair is one of the saddest I’ve ever read. I think its free verse format brings some beauty to the story. Set in Oklahoma during the Great Depression and Dust Bowl years, Billie Jo endures significant tragedy, loss, and despair. In the end, her fighting spirit, her hope in the future, and her ability to forgive are truly memorable. This would be an excellent story to accompany a history lesson of the time period for mature middle school students and is a thoughtful and unforgettable adult read. Bleak and intense. Eventually you get into the rhythm and the audiobook worked quite well. Though I want to get my hands on a hardcopy someday. I feel that this may be a good accompaniment to East of Eden. I also still want to read The Worst Hard Time: The Untold Story of Those Who Survived the Great American Dust Bowl. Newbery Medal winner in 1998. I am because of the dust. And what I am is good enough.